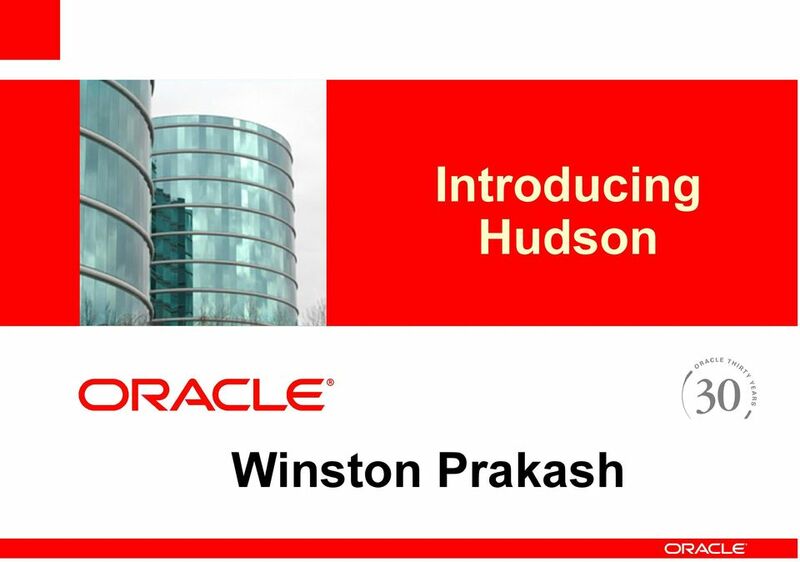 Download "<Insert Picture Here> Introducing Hudson. Winston Prakash. Click to edit Master subtitle style"
2 What is Hudson? 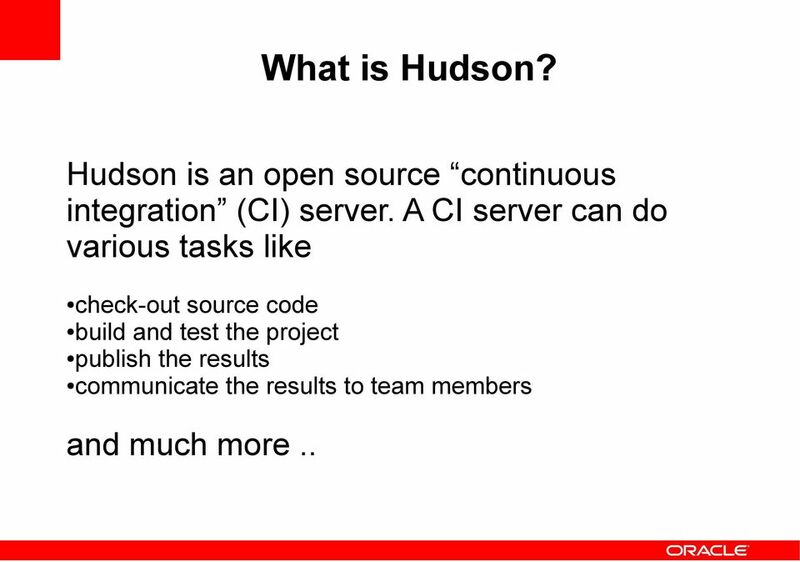 Hudson is an open source continuous integration (CI) server. A CI server can do various tasks like check-out source code build and test the project publish the results communicate the results to team members and much more..
5 Available Plugins However, there are more than 150 plugins available for various topics such as Artifact Uploaders Authentication Build Notifiers Build Reports Build Tools Build Triggers Build Wrappers Cluster Management etc..
6 Plugin Updates When an update to an installed plugin is released, it is available to the user via the update tab in the plugin page (Home Manage Hudson Manage Plugins) Trouble Shooting: If a newly installed plugin doesn't show up or updated plugin is behaving erratically, shutdown and restart Hudson. 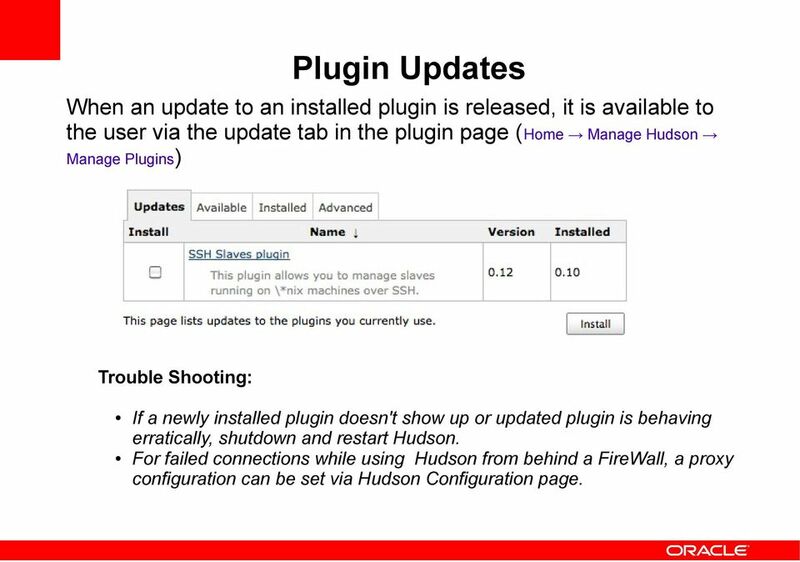 For failed connections while using Hudson from behind a FireWall, a proxy configuration can be set via Hudson Configuration page. 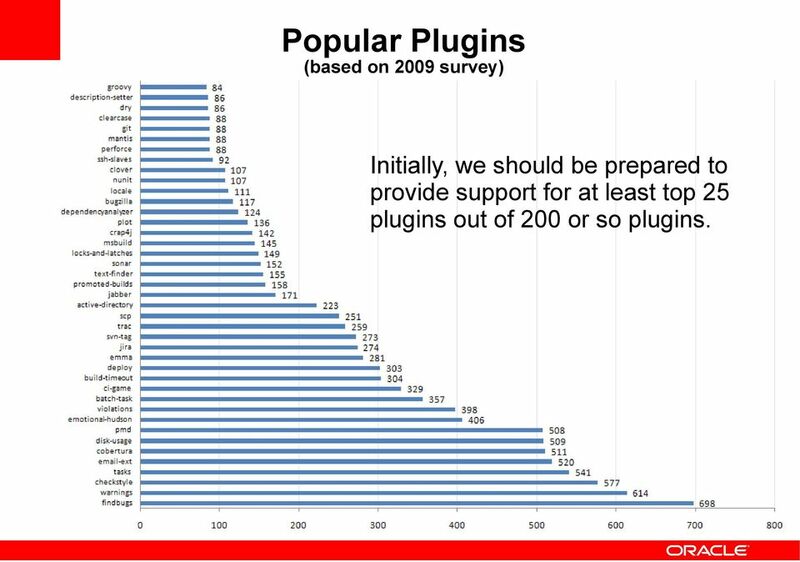 7 Popular Plugins (based on 2009 survey) Initially, we should be prepared to provide support for at least top 25 plugins out of 200 or so plugins. 8 Installing and Running Hudson There is no Installation step! 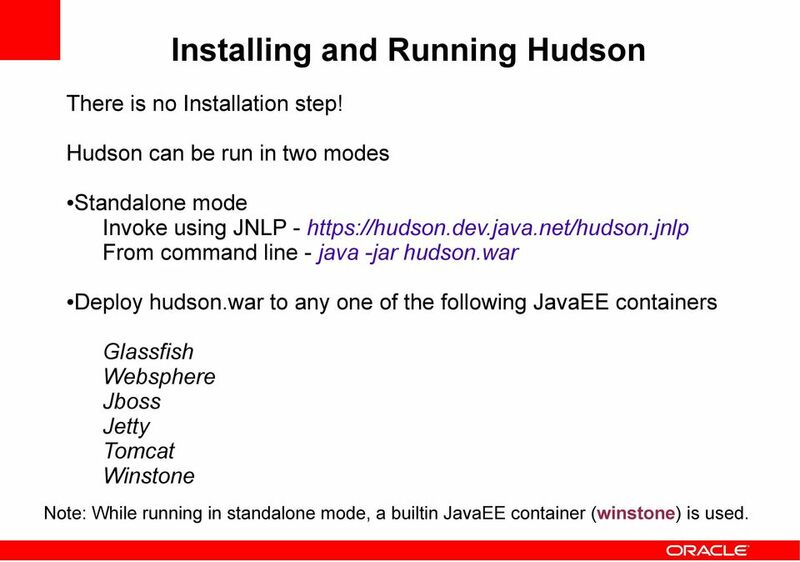 Hudson can be run in two modes Standalone mode Invoke using JNLP - From command line - java -jar hudson.war Deploy hudson.war to any one of the following JavaEE containers Glassfish Websphere Jboss Jetty Tomcat Winstone Note: While running in standalone mode, a builtin JavaEE container (winstone) is used. 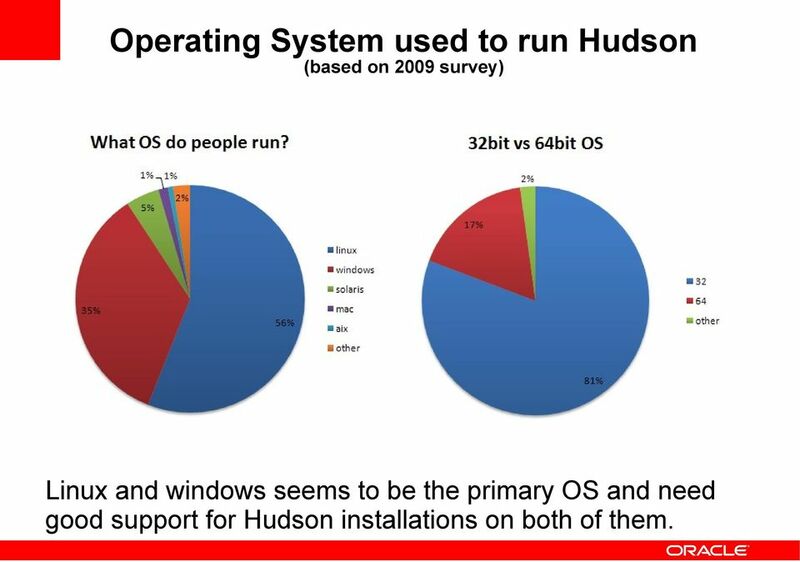 9 Operating System used to run Hudson (based on 2009 survey) Linux and windows seems to be the primary OS and need good support for Hudson installations on both of them. 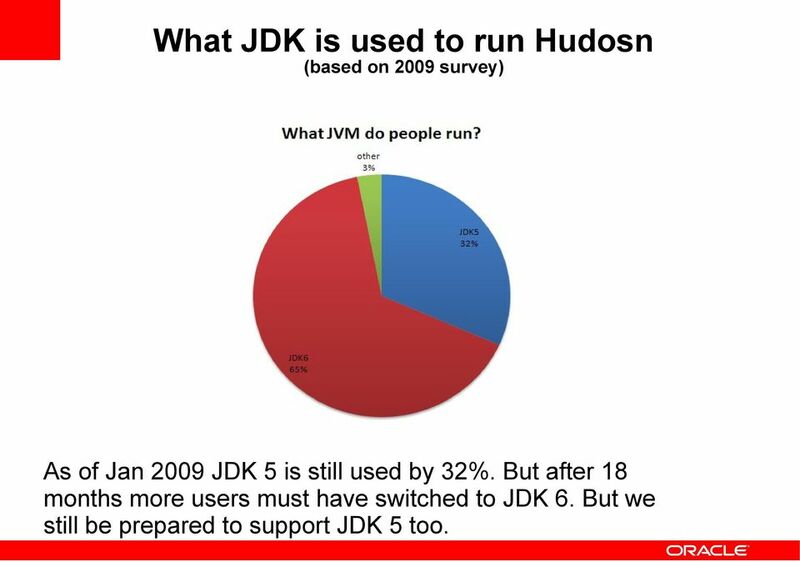 10 What JDK is used to run Hudosn (based on 2009 survey) As of Jan 2009 JDK 5 is still used by 32%. But after 18 months more users must have switched to JDK 6. But we still be prepared to support JDK 5 too. 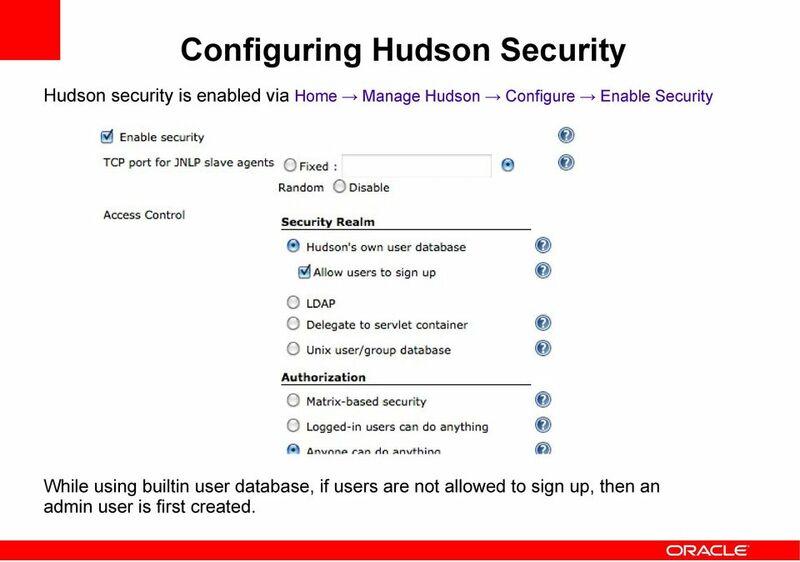 13 Configuring Hudson Security Hudson security is enabled via Home Manage Hudson Configure Enable Security While using builtin user database, if users are not allowed to sign up, then an admin user is first created. 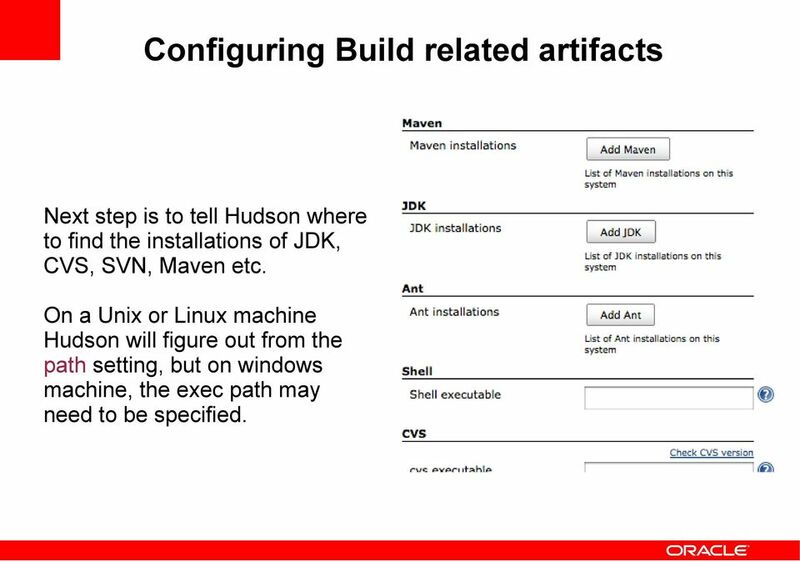 14 Configuring Build related artifacts Next step is to tell Hudson where to find the installations of JDK, CVS, SVN, Maven etc. On a Unix or Linux machine Hudson will figure out from the path setting, but on windows machine, the exec path may need to be specified. 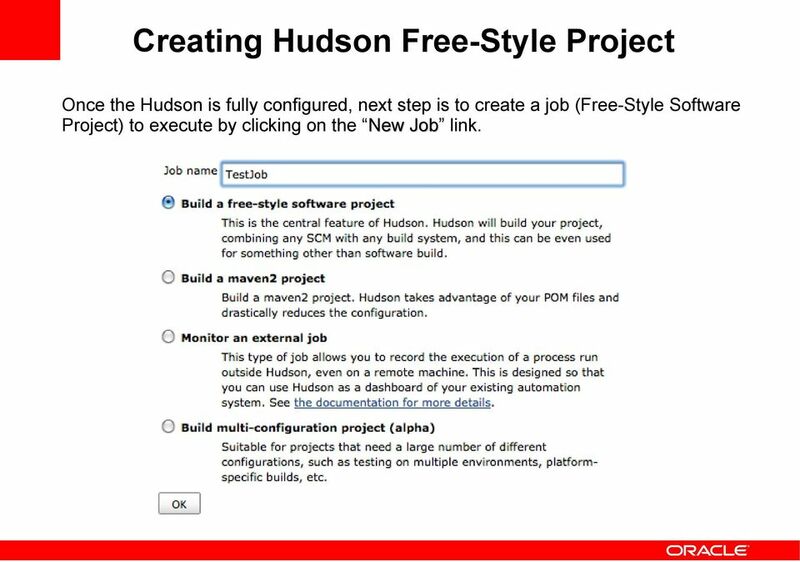 15 Creating Hudson Free-Style Project Once the Hudson is fully configured, next step is to create a job (Free-Style Software Project) to execute by clicking on the New Job link. 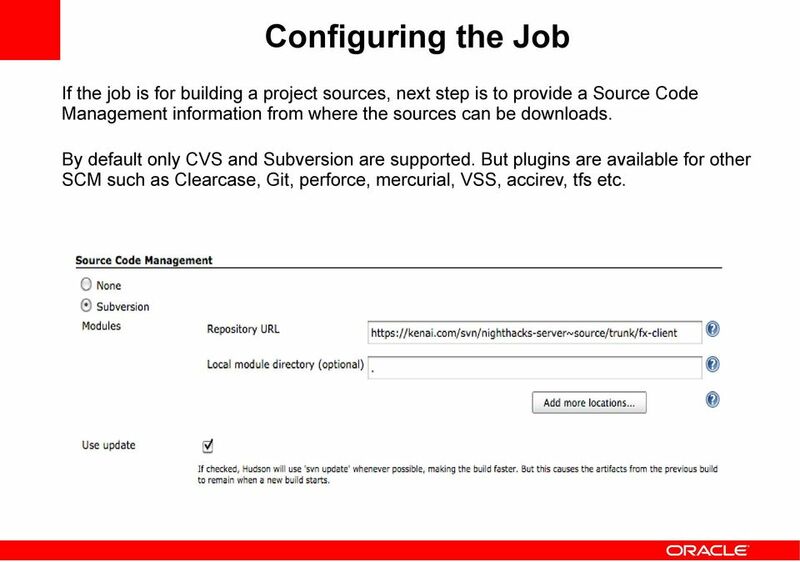 16 Configuring the Job If the job is for building a project sources, next step is to provide a Source Code Management information from where the sources can be downloads. 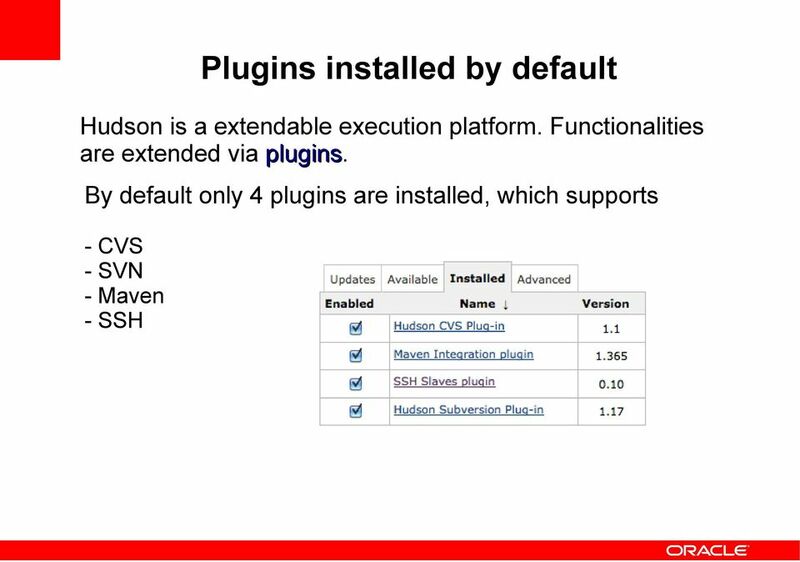 By default only CVS and Subversion are supported. 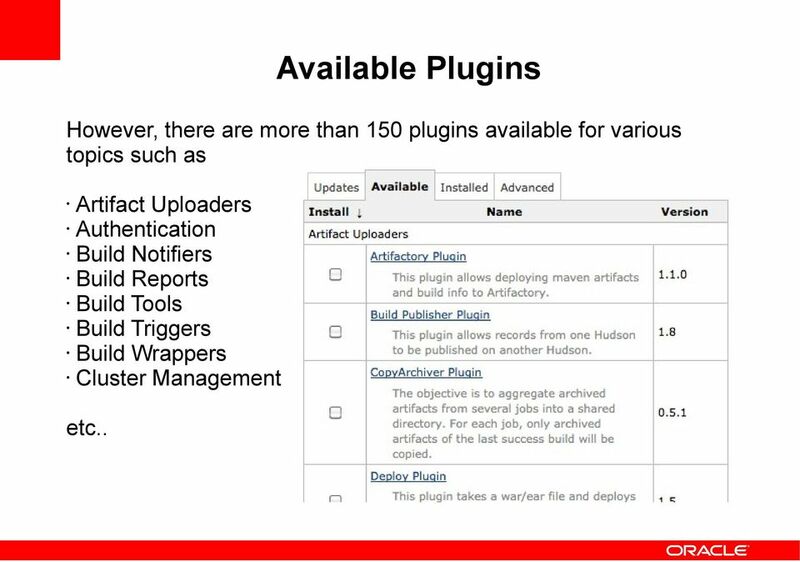 But plugins are available for other SCM such as Clearcase, Git, perforce, mercurial, VSS, accirev, tfs etc. 18 Configuring the Job Continued.. Next we must specify when the build should get triggered. The obvious choice for Software project is when somebody checked into SCM. 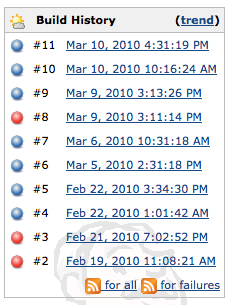 In the following example, SCM is polled for every 5 minutes to see if any new checkin has happened. 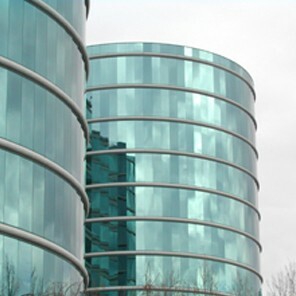 Optionally it is possible to make the current project to build after other projects are built. 19 Configuring the Job Continued.. The last mandatory step is to tell Hudson how to build. Usually it is done via an ant build. 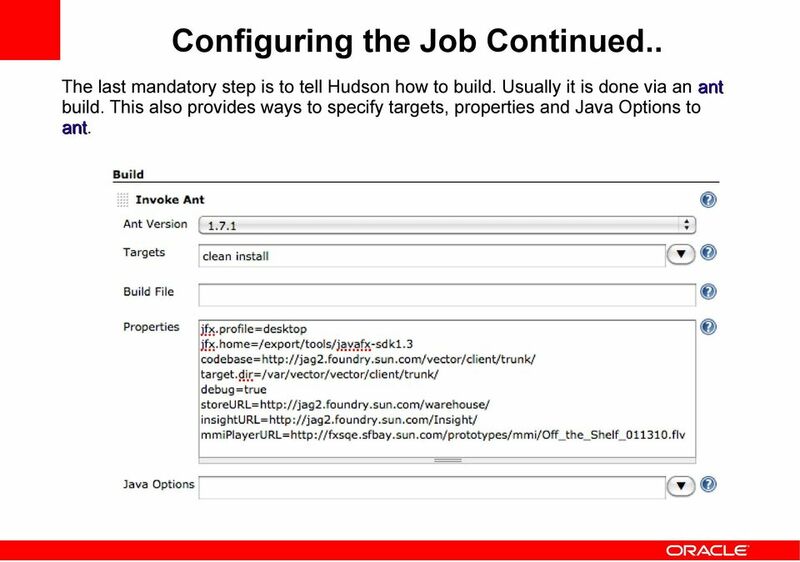 This also provides ways to specify targets, properties and Java Options to ant. 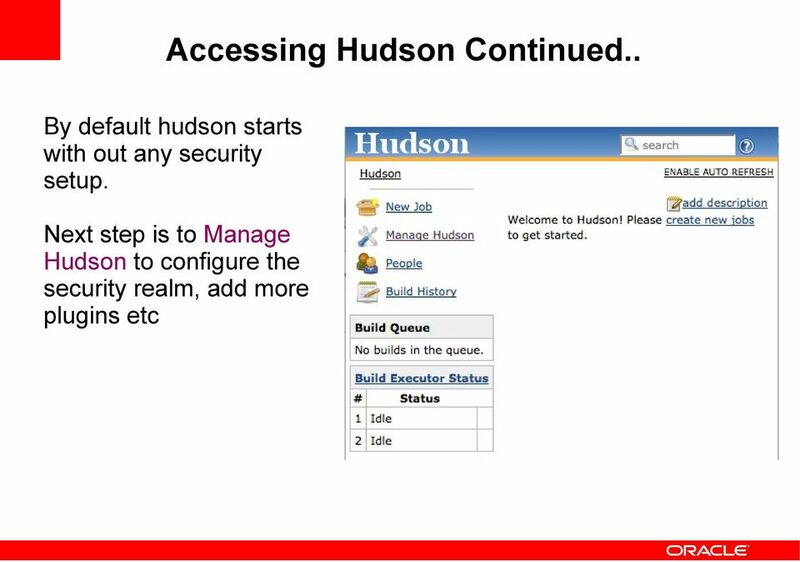 20 Configuring the Job Continued.. Another important option is to tell Hudson whom to send when the builds become unstable. 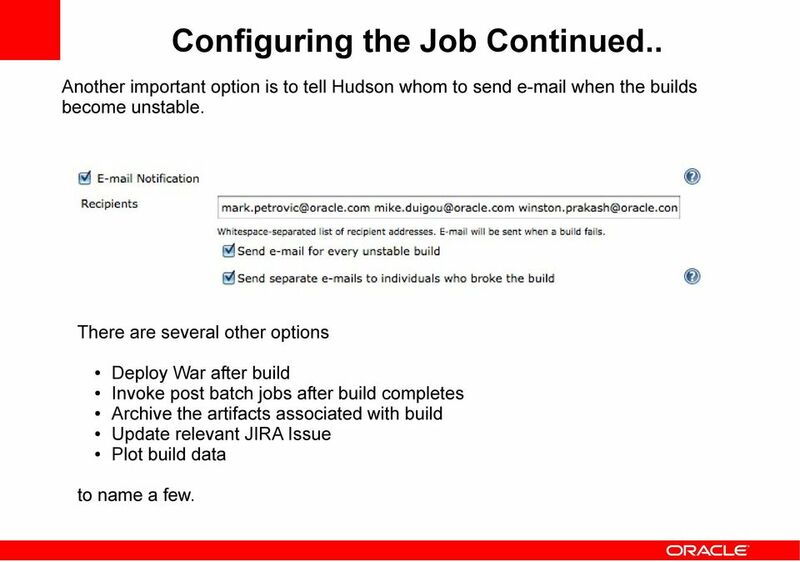 There are several other options Deploy War after build Invoke post batch jobs after build completes Archive the artifacts associated with build Update relevant JIRA Issue Plot build data to name a few. 21 Hudson is ready to Build That's all. Hudson is ready for Continuous integration. Automatically builds will get triggered when ever someone checked in to the SCM. When a build is successful it is indicated by a blue ball. A red ball denotes a failed build. Failed Successful Unstable Unstable (Ex. Failed test) builds are indicated by Yellow ball. Fade Blinking If the ball is blinking, then it represents an ongoing build. 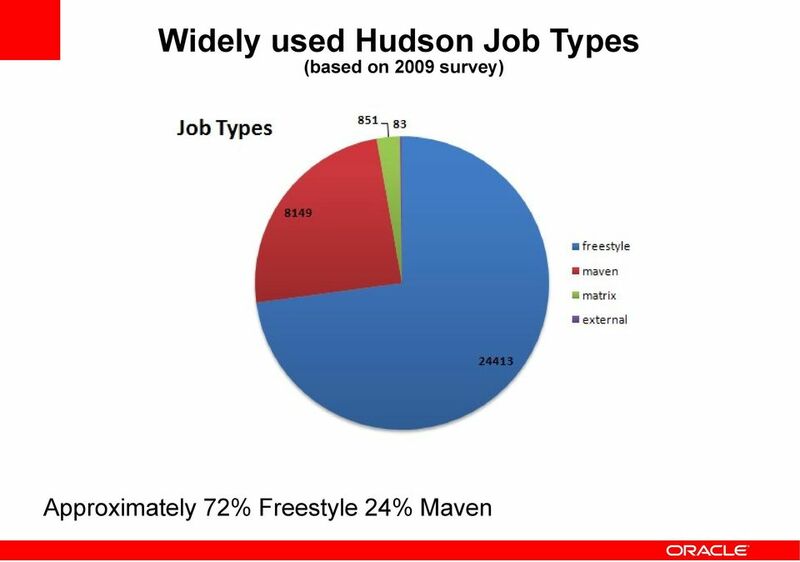 23 How many Hudson jobs people are creating (based on 2009 survey) 90% of the Hudson installations run less than 30 jobs. 26 Tracking Versions using Fingerprints The fingerprint of a file is simply a MD5 checksum. 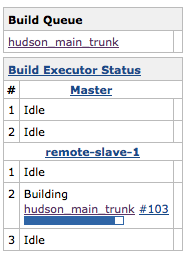 Hudson maintains a database of md5sum. 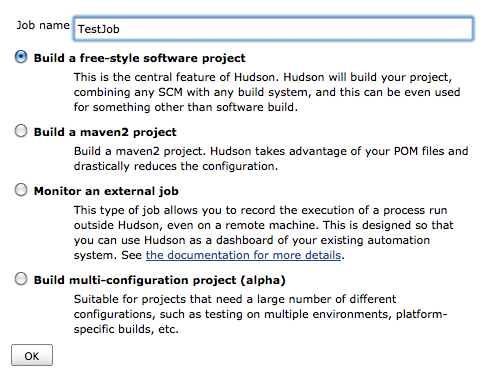 For each md5sum, hudson maps it to a project and corresponding build. These files are stored at $HUDSON_HOME/fingerprints. Project Relationship is maintained by jar files that your Upstream project produces. jar files that your dependent (downstream) project rely on. Suppose there are two projects TOP and BOTTOM project and assume TOP depends on BOTTOM. You are working on the BOTTOM project. The TOP team reported that bottom.jar that they are using causes an NPE, which you thought you fixed in BOTTOM #32. 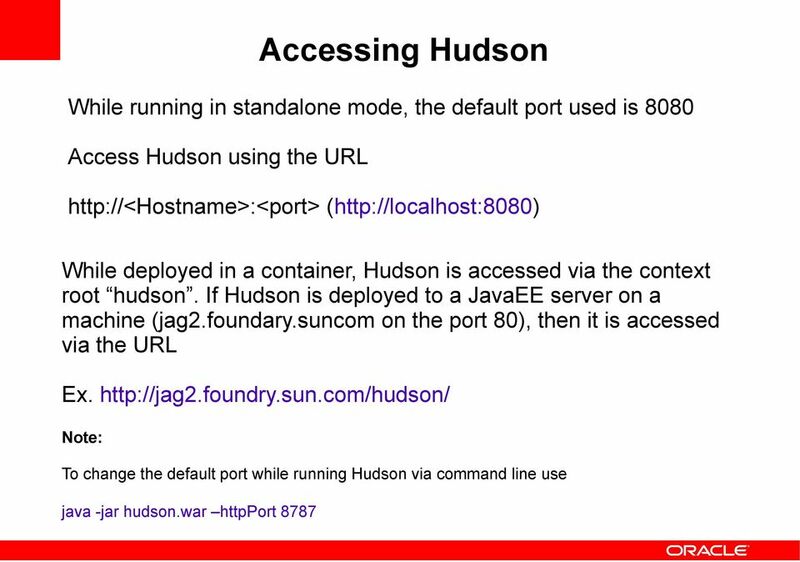 Hudson can tell you which TOP builds are using (or not using) your bottom.jar #32 via fingerprints. 27 Project Dashboard The Dashboard for particular project provides view for Last Successful Build Info Latest Test Result Monitoring Disk Usage Actions like configuring the job etc Test Result Trend Recent changes that caused the build etc.. 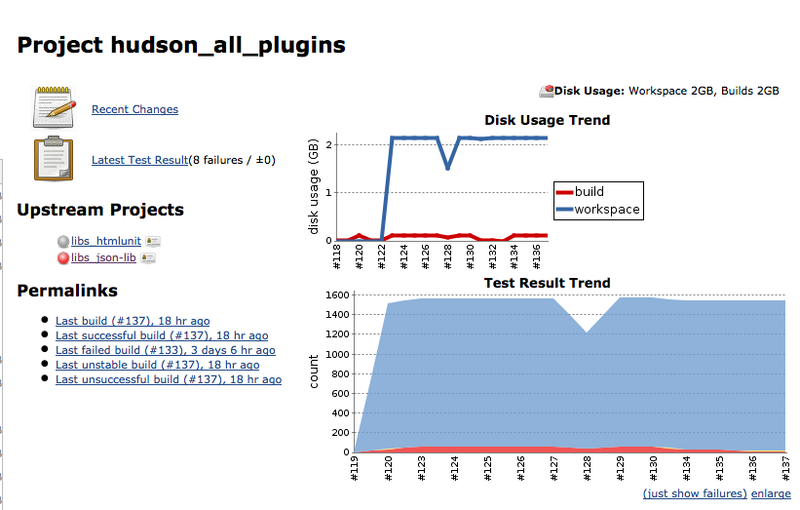 Various views in the project dashboard depends on various plugins installed. 28 Build Dashboard The Dashboard for a particular Build provides view for Artifacts corresponding to this Build Changes that caused this Build Test Results Build console output etc.. Subversion Server for Windows VisualSVN Team VisualSVN Server: Subversion Server for Windows VisualSVN Team Copyright 2005-2008 VisualSVN Team Windows is a registered trademark of Microsoft Corporation.